A natural and astrological variable that affects the temperament of every individual, is the number of sunspots at the time of everyone's birth. It is an important parameter in the personality of the person and we all understand that there is big difference between a child born when the Earth is bombarded by solar wind, and a child born when the Sun is in a recession of its activities. The "Astrology of the 13 signs of the Zodiac" contains a theory linking the intensity of the solar wind (and the number of sunspots) with the temper and temperament of each individual. The table that gives as the ratio and the connection between the number of Sunspots and the characteristics they give to every man, is found in an autonomous chapter of the book ""Astrology of the 13 Signs of the Zodiac" by Vasilis Kanatas" and is an integral part of the New astrological theory. Astrology of the Thirteen Signs of the Zodiac is a book which explains a new theory in this ancient field of study.It was prompted by the fact that Western Astrology has outlived its lifetime and its elements have been rendered obsolete by its cousin, the science of Astronomy.The precession of the equinoxes, that is, the movement of the point of intersection of the celestial equator by the ecliptic by 50.2” (seconds of a degree) each year, prompts corresponding discrepancies in the predictions of astrology, which move further and further away from re ality with each passing year.Since 100 A.D., when Claudius Ptolemy wrote his Tetrabiblos, the zodiac constellations have moved approximately 29.2° across the sky, enough to ensure that the predictions of Western Astrology are completely misguided. The Astrology of the 13 Signs of the Zodiac takes into account all available modern scientific information regarding the actual positions of the 13 Zodiac constellations and offers Astrology a way out.The only reasonable path now available to it is the acceptance of the 13 Signs of the Zodiac and the new theory, on the basis of which the Moon and the Sun are given their rightful place.In 13 Zodiac Sign Astrology, the Ascendant is represented by the position of the Moon, the celestial body which truly affects our lives, and not by some distant constellation.Lastly, sunspots, which have a well-documented impact on the Earth and its people, take on an important role in the New Astrology. Only the Astrology of the 13 Signs of the Zodiac is firmly grounded in the sciences, and particularly in Astronomy.It recognizes the influence that the planets have over our lives through their interactions with the Sun and the disturbances they cause in its magnetic field, and the effect this has on the magnetic field of the Earth itself. Vasilis Kanatas was born in Amfissa of the City of Delphi on January 3,1967. He studied physics at the University of Patras in Greece. He made his diploma thesis in astronomy-uranography with the subject "About constellations." In this work he described the 88 constellations of the sky and came in contact with Horoskopic Astrology of the 13 zodiacal constellations. His contact with astrology has changed his life since he dealt with the idea of the 13 zodiac signs. He read the ancient authors that found Horoskopic Astrology and especially Claudius Ptolemy. The last 20 years he studied Astrology and Astronomy in order to base his theory as described in the book "Astrology of the 13 signs of the Zodiac". Since graduating in 1992 he dealt with the Amateur Astronomy, with his telescope, almost every day and studying the starry sky. He is an amateur astronomer and member of the Association of Amateur Astronomy "Achyrostrata" located in the Municipality of Delphi. In the meetings of the club, he has made presentations on scientific topics and issues of uranography. In the last 20 years he is a professional of the tourism business. Apart from Greek he speaks English, French, German and some Italian. He is dealing with social networks and the internet since 1994 and knows PC Programming. He makes software for his business and for public purposes. Astrology of the 13 Signs of the Zodiac offers a new theory of Western Astrology designed to make it compatible with the science of Astronomy. (The new sign is Ophiuchus; it comes between Scorpio and Sagittarius). Chapters outline a perspective of the Moon - a celestial body that is much closer to us and has a greater effect on our daily lives than faraway constellations - as the Ascendant. Sunspots also play a greater role in this new astrological method, designed to correct imbalances such as those that come simply from the constellations slowly shifting position in the sky ever since ancient times. A wealth of black-and-white illustrations complement this methodical walkthrough of a new way for gleaning metaphysical wisdom from the night sky. The "Astrology of the 13 signs of the Zodiac"was a pleasant reading and an eye-opener. It explains,in layman's terms, the fallacies of traditional Astrology and adds a new perspective in Astrological readings by taking into account the influence of sun spots.A brilliant idea and one which makes sense as it is based on Astronomy. 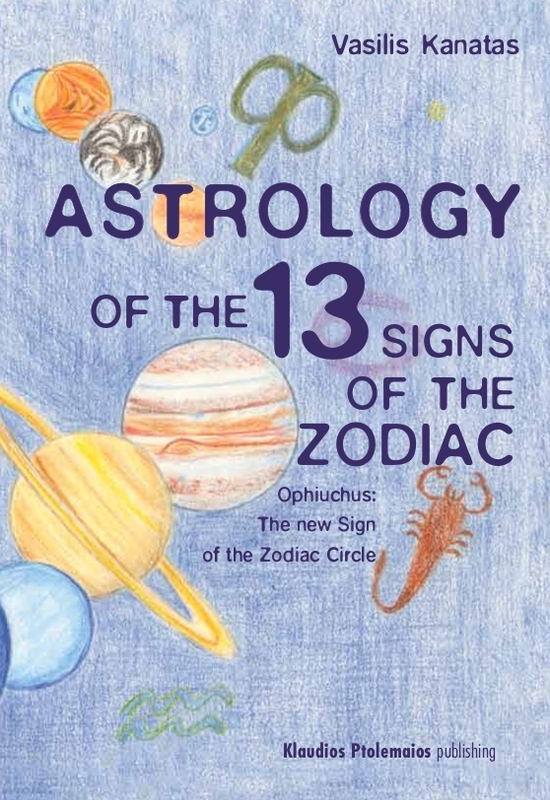 The book ,in my opinion,is easy to read, has the right length and with the use of diagrams and pictures gets the main message across without getting into many technical details that might confuse the average reader.All in all an innovative approach to Astrology and a pleasant reading for those that want to discover its scientific roots. I was given this book as a gift. Very impressive! I wasn't an avid follower of astrology, just here and there, but I found your book enlightening. The science is explained in a way that even I understood what was going on. Surely it's obvious there's a 13th star sign. Are you coming out with any more books on this subject? I'll keep my eyes open. The Zodiac dates (example: Aquarius 16 February 12 March) are valid for people born in the year 2013 -4. Please look at "Find your true Zodiac Sign in order to find your 100% correct Zodiac Sign).